atmega168 | pn532 | sparkCore | mac_osx > read Mifare cards over the internet! In the future there is a bar where all the dead punk rockers hang out. They are each given a MiFare classic card programmed with their name and 666 credits. This is the device the bartender uses to keep track of their tab. This project uses an atmega168 to control a pn532 breakout board to write cards as well as read them. Once the data is read it gets sent to the Particle core over USART and then sent over Wifi to the internet. There is a Mac OS X application that receives the data and stores it in a CoreData model. 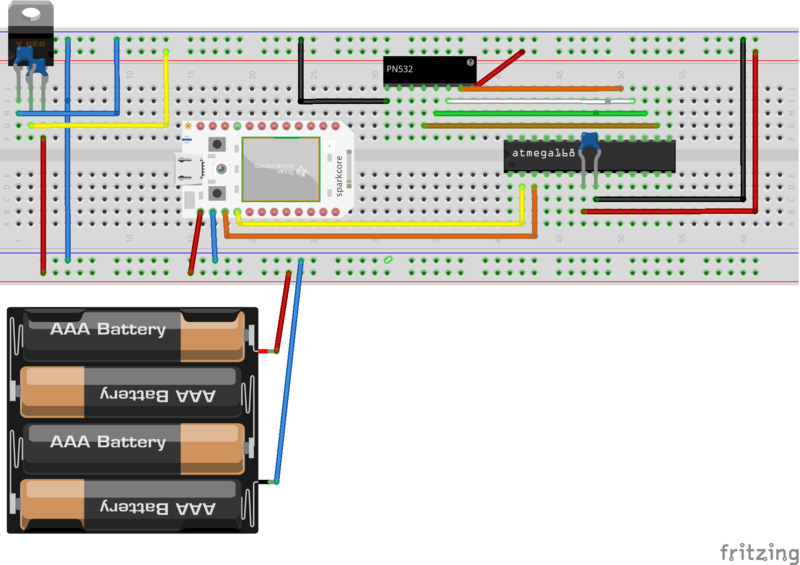 Besides having fun with an nfc card reader, this project is an example of how to use the spark core to communicate with other devices. 1) in order to program the atmega168 you need an isp programmer. I use an Arduino micro that I flashed with the Arduino isp code from their ide. Elliot Willams has a book published by MAKE called AVR Programming that is an awesome resource. 2) you need to flash the Spark Core with the web ide using a USB cable, but DON'T try to power the Spark with the 5v battery at the same time. Once the code is flashed you can power the device and MAKE SURE to use a voltage regulator to run the pn532 and the atmega168 at 3.3v so the UART pins are at 3.3v. The Spark Core rx and tx are not 5v tolerant. update 7-24// took out setTimeout(0) and flush() in loop. compile with gavrasm. flash with avrdude. Started programming again after 25? years.